People can get very annoyed or scared by spooky behaviour, especially when accompanied by prancing and pulling. I’ve heard a number of theories about why horses behave like this especially while on a trail ride, and most of them come from a lack of knowledge about the prey animal psyche: “He’s competitive, he likes to lead, he just loves to run, he’s just stupid”. If we are going to help our horses, the first step needs to be understanding the horse’s perspective. Horses are prey animals. Much of their brain is given to making sure they are not going to be eaten. They are highly perceptive and always on alert. The further they get from home, the less secure they feel, and spooking on the trail is a great example of how a prey animal acts when he feels in danger. His senses become incredibly heightened. He’ll hear, sense, smell and see things that you are unaware of. That’s how horses have survived for 60,000 years! Interestingly enough, dominant, sensitive horses are more likely to have trouble on the trail. They are used to making the decisions for the herd, and these decisions are primarily based on keeping the herd safe. Once under the control of their rider, they now find themselves unable to influence the herd. If they do not respect the rider as their alpha, they become upset and their behaviour becomes increasingly uncontrollable. 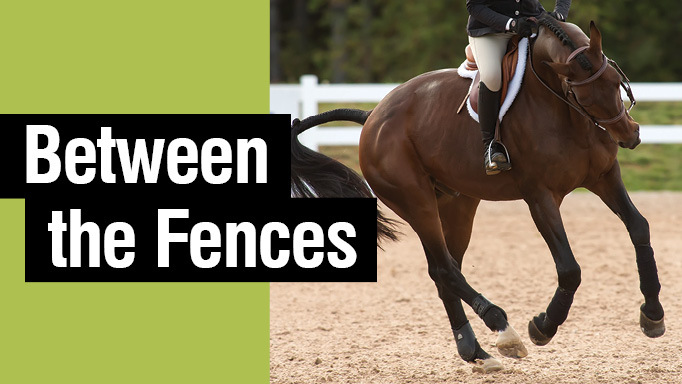 When people say their horse is just trying to get in front, the opposite is usually true. They are actually trying to lead the herd to safety. If this isn’t possible, then the horse will try to get to the middle of the herd where it is safest. Please note, it isn’t only alpha horses that have trouble; any horse can. If a horse is sensitive, highly strung, fearful, or dominant, it is more likely to exhibit this insecure behaviour. What would he do if you got off? I’ve done experiments where I’ve had the rider dismount from the spooking, prancing horse and turn him loose. The first thing the horse does is head out front and try to get the other horses to follow. When they don’t, he runs back and tries again. This usually happens a few times before the horse realizes that he’s not in charge. Then he’ll calm down, settle in behind the lead horse (or horses), drop his head and walk along quite relaxed, no more spooking or prancing! This tells you a lot about the prey animal and herd mentality. As long as they can depend on an alpha, they’ll settle right down. Now here’s the secret: you have to become his alpha. Then he’ll never feel alone and afraid on the trail. If you are calm, he’ll be calm. Horses play dominance games with each other every day to maintain their “pecking order”, and this is something you’re also going to have to do whenever you are with your horse. You see, horses vote every day for their leader. Every day! If your leadership is not firmly established before you go on the trail, you will lose the vote that day. You can’t force your horse to accept you as his alpha, you have to earn it and you do this via the Seven Games. How can you and your horse be better prepared before you go out on the trail? 1. Don’t head out until your horse is in “left brain” mode (he’s thinking and calm). 2. To achieve this, play the Seven Games until your horse is accepting your alpha position. Think of it as your pre-ride check – like a pilot’s fre-flight check. You can use a lot of simulation, getting a friend to try to spook your horse while you are playing the Seven Games, and teaching your horse to get braver through desensitization. Then, practice it on his back. If he spooks, turn him to face the danger, allow him to back up but not to turn away, smile, yawn, and relax through the whole thing. Then just carry on like nothing happened. This is something to start working on today, so that in a week or two you’ll have a different horse. You can’t just do it once and think “he’s fixed!” This is not a motorbike! 3. Make sure you can walk, trot and canter on a loose rein, and easily bend to a stop. If you or your horse are out of sorts that day and you cannot ride on a loose rein, don’t go. 4. Give yourself an emotional assessment: No matter how scared your horse gets, can you remain totally calm? Most people spook worse than their horses, suddenly grabbing with legs and hands and getting tight. This not only makes the horse spook worse, but it makes him more inclined to keep spooking because he will doubt your confidence and leadership. 5. If you lose the connection with your horse in the middle of the trail ride, don’t be too embarrassed to get off. You know you can get your horse back into his left brain on the ground via the Seven Games, especially the sideways and backwards games. 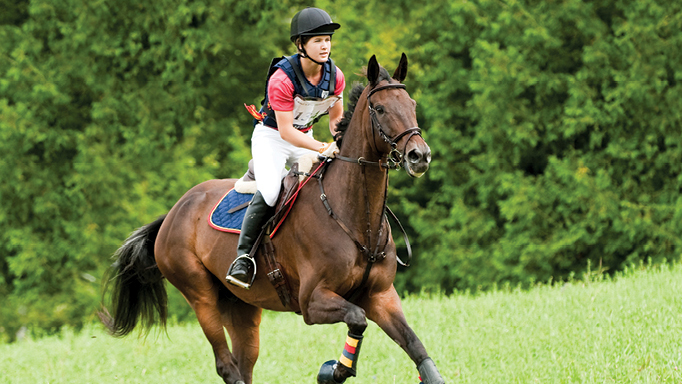 How to avoid bucking and playing on course, with Laura Tidball Balisky. 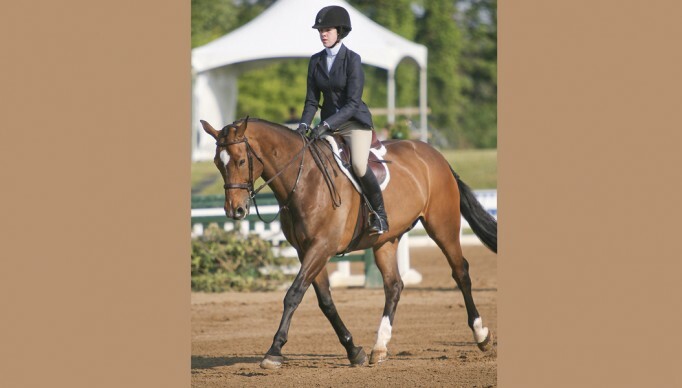 How to assess fitness and develop a conditioning plan to suit your horse and your goals. Learn how to put that extra 'polish' on your round with Bobbie Reber.